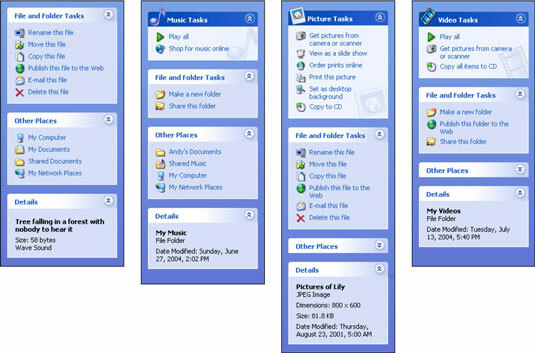 Every folder in Windows XP has a customized task pane, located in the folder’s left edge, that contains time-saving shortcuts related to that folder. As you open different folders, the shortcuts change to show tasks made for what you’re viewing.. The task pane in your My Pictures folder is particularly handy, providing quick ways to start a slide show, get pictures from a digital camera or scanner, print pictures, or copy all the photos to a CD. Click a file’s icon in the folder and look in the task pane’s Details area to see information about that file’s size, contents, and creation date. To move quickly from folder to folder, use the shortcuts in the task pane’s Other Places area. From there, you can jump to the desktop, My Documents folder, and other commonly accessed places.